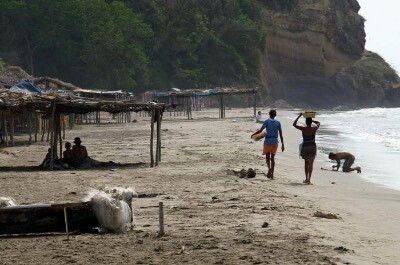 There are a wide variety of Cartagena beaches which are ideal for all types of beach goers including families. The most popular beach is Playa de Bocagrande where you will find a Miami Vice attitude and you will find a laid-back atmosphere at Playa de Castillo Grande where lounging and swimming conditions exist on two distinctly different beach areas. Water taxis to the stellar beaches of Isla Tierra de Bomba are available from Playa de Castillo Grande and once at Playa de Punta Arenas you can visit the Bomba Beach Club for a relaxing time. Playa Blanca on Baru Island is one of the most famous white sand beaches of the area where you will find plenty of amenities. If you want seclusion you should try Playa de la Boquilla and the Playa de Oro section of Playa Manzanillo del Mar boasts a real Columbian experience. If you are searching for a family-friendly Cartagena beach that is perfect for beach goers looking for a patch of white sand and the beautiful turquoise colored water of the Caribbean Sea then you should try the Playa Blanca on Baru Island Tour. Your full-day adventure starts with a 1-hour drive through several surrounding areas of Cartagena until you reach Baru Island where you will cross over via a recently constructed bridge. Once you reach Playa Blanca you will be excited to find plenty of white sand where you can lounge and opportunities for watersport activities from swimming to kayaks to jet skis. You can spend your day at Playa Blanca relaxing as well as playing in the turquoise colored waters of the Caribbean Sea and if you are looking for more seclusion then just take a short walk along the beach until you find your place of happiness. Your excursion includes a complimentary lunch and you can purchase libations during your day at the beach before you head back to your Cartagena hotel. 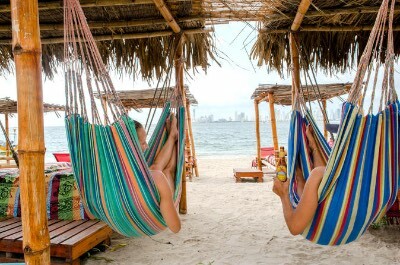 If you are interested in a fantastic day at a white sand Cartagena beach area that offers a laid-back but lively atmosphere then you should go on a Bomba Beach Club Tour. Your flexible beach adventure will first start by arriving at Playa de Castillo Grande where you will take a quick 10-minute water taxi or boat ride to Isla de Tierra Bomba. Once you land on the island you will notice a difference in the sand, the water color and when you arrive at the Bomba Beach Club you can decide whether your day will be spent in a hammock or day bed under the sun. The ocean area in front of the Bomba Beach Club is protected from boats and there is a variety of watersport equipment for you to rent. The beach club itself has a great environment that mixes music with a laid-back attitude as well as a freshwater swimming pool. You can purchase drinks at the beach or swimming pool areas as well as other food before you indulge a complimentary lunch. Your beach club adventure ends with a quick boat ride back to Playa de Castillo Grande. One of the more secluded Cartagena beaches that offer nice sand, a quiet atmosphere and plenty of space for all types of beach goers is Manzanillo del Mar. Located 40-minutes north of historic downtown Cartagena, Manzanillo del Mar has a long swath of golden brown sand and can be accessed off of Carrera 3. Manzanillo del Mar has become quiet since there is a bridge connected Playa Blanca to the outside world. Once you are at Playa Manzanillo del Mar you will find a relaxing setting with a few vendors or facilities renting beach equipment and watersport adventures. There are several informal beach bars and restaurants for refreshments as well as unique seafood dishes. If you travel south down the beach area and pass over a large rock outcropping you will find the gem of the area which is Playa de Oro or Gold Beach. Here you will find more beach shacks with beach equipment or your favorite watersport equipment for you to explore the Caribbean Sea. 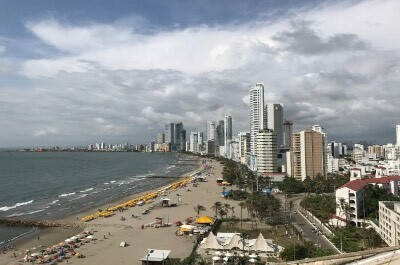 The most popular Cartagena beach for beach goers who are looking for multiple watersport activities, a lively atmosphere and plenty of conveniences is Playa de Bocagrande or Big Mouth Beach. Located on the Bocagrande Peninsula less than 2-miles south of historic downtown, Playa de Bocagrande is situated within an affluent tourist area and can be accessed from Carrera 1 as well as Avenida San Martin. The stretch of brownish-golden sand along the Caribbean Sea at Playa de Bocagrande is the longest beach area in Cartagena with lots of room to lounge and play beach games on the brownish-golden sand along the Caribbean Sea coastline. Swimming at Playa de Bocagrande is dependent on the rip currents and there are plenty of vendors renting watersport equipment such as canoes, kayaks, surf boards and jet skis. The beach area also features numerous beach clubs which are available to the public or associated with hotels as well as plenty of options for fresh seafood as well as cold libations. When you are looking for a quiet Cartagena beach that offers plenty of watersport activities and is a favorite with locals then you should plan a trip to Playa de la Boquilla. Located 20-minutes north of historic downtown Cartagena, the Playa de la Boquilla is situated on a narrow strip of land along Carrera 3 between the Caribbean Sea and Cienaga de Tesca. The sandy area at Playa de la Boquilla is expansive with plenty of room to relax on the sand and play beach games. You will also find a variety of watersport activities such as jet skiing, kayaking, swimming and standup paddleboarding. One of the more popular things to do at Playa de la Boquilla is to take a canoe trip into the numerous mangrove forests that dot this area of coastline. When you are at Playa de la Boquilla you can find plenty of beach equipment for rent at one of the many beach clubs as well as food and drink service. If you are seeking the one of the best Cartagena beaches that offers a laid-back atmosphere with opportunities for sunbathing and swimming then you should visit Playa de Castillo Grande or Big Castle Beach. Located on the eastern shoreline of the Bocagrande Peninsula just east of the el Laguito areas, Playa de Castillo Grande can be accessed from Calle 5 and Calle 6. When you arrive to Playa de Castillo Grande from Calle 5 you will notice a large swath of sand that is ideal for sunbathing with numerous vendors selling goods. The farther you walk east the more seclusion you will find until you reach the Naval Club where you can enjoy comfortable services like cabana rentals. Swimming is more ideal along the area of beach off of Calle 6. Here you will find calm waters that are protected by the peninsula as well as several options for watersport activities. There are several places along Playa de Castillo Grande to enjoy refreshments and local seafood specialties. When you are looking for that perfect white sand beach which can be accessed quickly and offers a Caribbean experience then the ideal Cartagena beach to visit is Playa de Punta Arena or Sand Point Beach. Located on the northern shoreline of Isla de Tierra Bomba, the Playa de Punta Arena is situated within a 10-minute boat or water taxi ride from Playa de Castillo Grande and is a favorite with late rising beach goers who are looking for a large beach that boasts a mixture between a party atmosphere as well as a relaxing setting. Playa de Punta Arena sports a nice white sand where you can choose to play beach games or relax and the water is generally calm for swimming with a more defined blue and turquoise color more commonly found within the Caribbean Sea. The Playa de Punta Arena is a favorite for all types of beach goers and watersport enthusiasts with plenty of onsite vendors offering watersport equipment rentals. You can find several beach clubs that offer a lively atmosphere or you can relax on a hammock at the famous Bomba Beach Club.